When David Popiel, MD, MPH, assistant professor of medicine at the George Washington University School of Medicine and Health Sciences (SMHS), was inducted into the Arnold P. Gold Foundation’s Gold Humanism Honor Society (GHHS) as medical student, Arnold Gold gave him a challenge: find your next step in your practice of humanism. Twelve years later, Popiel issued a similar challenge to the 25 medical students from the Class of 2018 inducted into GHHS. 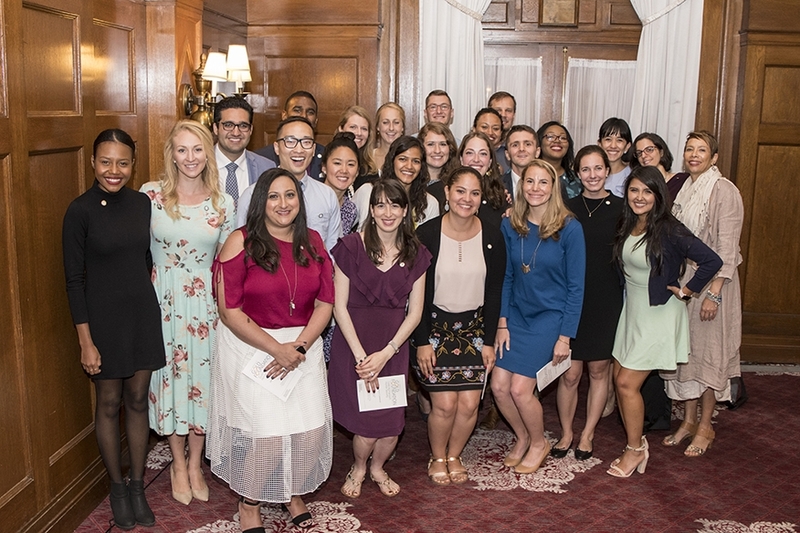 “I know many of you have incredibly big hearts, very smart brains … I know many of you are just infectiously excited about practicing medicine … So what is your next step?” Popiel, this year’s GHHS faculty inductee, asked during the induction ceremony held at Washington, D.C.’s historic Willard Hotel during Commencement Week. Maintaining humanism remained a consistent theme during the ceremony. “We all have our stories. Everyone has a story. I think as long as you remember that with your patients, that is what is going to keep you human,” advised Laura Tiusaba Guzman, a fourth-year medical student at SMHS. Fellow graduating student and inductee Emmeline Ha thanked the other society members and acknowledged how their compassion and support kept her going during medical school. “Please continue to embody those values [of humanism] so that you can inspire your patients, your peers, and your students to be like that too,” she said. Yolanda Haywood, MD, RESD ’87, BA ’81, associate dean for diversity, inclusion, and student affairs and associate professor of emergency medicine at SMHS, congratulated inductees and reminded them that “membership in the Gold Humanism Honor Society is considered a mark of excellence.” She issued her own challenge as well. “We talk about humanism, but your humanism is all grounded in your ability to love … your classmates, your patients, your families, and even us as the administration. Your challenge today as you move into the next stage of your career is to figure out a way to carry that with you and not ever let it go. Because there is such power in it – it’s unbelievable,” Haywood concluded.